Day 1 – Thursday, May 20. The four of us (two cars two canoes) left Toronto around 7:40AM up the 400 ands stopped at Husky’s off 88 for breakfast, then up Hwy 11/12 to Orillia and over to road 45 which passes by Head Lake (Jedi Jeffi’s favourite starting spot) and up Hwy 35 to 2 and then the dirt road to Devil’s Lake put in. Got on the water at noon. There was lots of goose poop on the grass and on the dock there. Quite a mess. The weather was sunny and very hot. Many cottages on the lake here. Not having the exact information about the portage location to Sheldon Lake, we asked a guy at a cottage about 2/3 up the lake and he told it was in the next bay and that we would see a truck there. 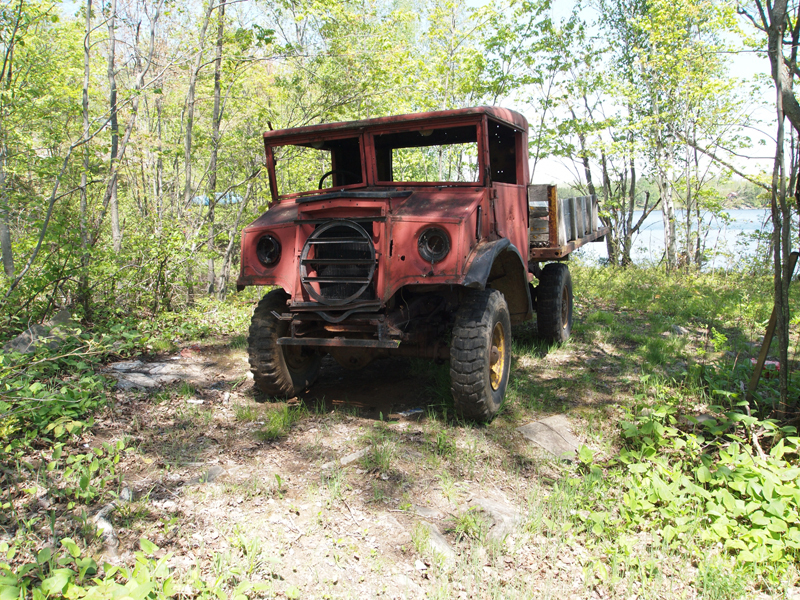 Sure enough there it was with an ancient truck there (Later we found our it was a 1947 truck used by the cottage owners on Sheldon Lake). We started portaging (the portage is actually like an old road with tracks of trucks and the Argo) in the mid-day heat and the portage goes through a wide open sparsely forested area with small trees and is mostly in the sun and we baked all the way, sweated worse than Vinny Babarino’s Sweathogs! About the third of the way across there was a beaver pond with half a log bridge gone so we had to load up and paddle across. Ganaraska side trail crosses the portage just before Sheldon Lake and goes behind the campsite we camped on. All in all, we arrived at Sheldon Lake totally hot and with low water left in our water bottles. There were about a dozen cached boats there plus some old canoes. The portage is about 1000m long. 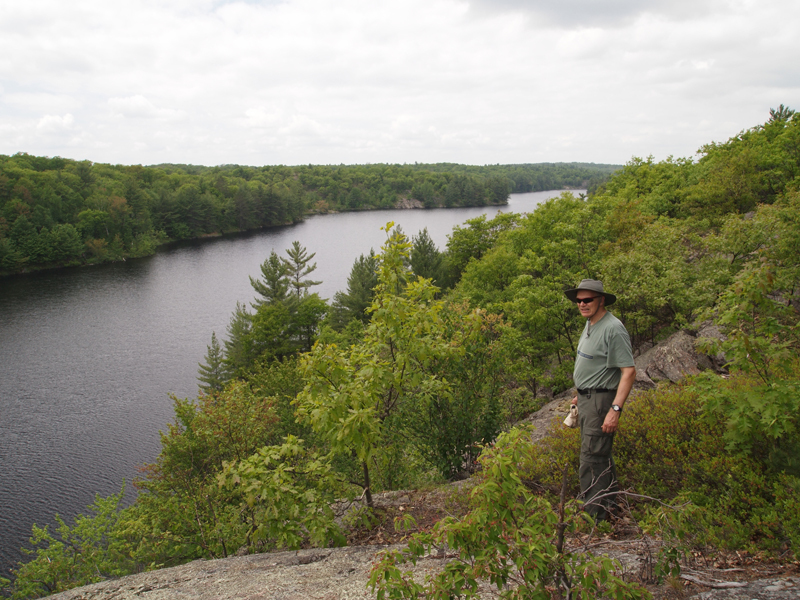 We then paddled onto the lake to look for a campsite and selected one on a high cliff just down from the portage but out of sight of the boats (we were looking for a space for 3 tents and a bug shelter since two of us were solo-tenting). The site is well exposed to all day sun and our tents ended up in the sun all day long (no real shade anywhere due to scarcity of large trees or any dense growth). We were all set up by 4:00 PM. A little later we heard a plane coming and a float plane and then a helicopter landed at the northwest bay where we saw a “cabin” from the end of the portage. We figured folks were coming for the weekend (these were the only people we would see for the 5 days). After dinner we sat around in the bug shelter. There were mosquitos and black flies but not as many as I expected. Day 2 – Friday, May 21. Today after breakfast we went for a day outing to Victoria and Wolf Lakes. On the way we stopped at the cottage in the northwest bay and asked where the portage was and were told that it is the road starting right at their place! They asked us about the bridge at Sheldon Lake portage and when they found out it was out they said they would go out today with the Argo (amphibious and land travelling 8-wheeler) to fix it since they use it to go back and forth. 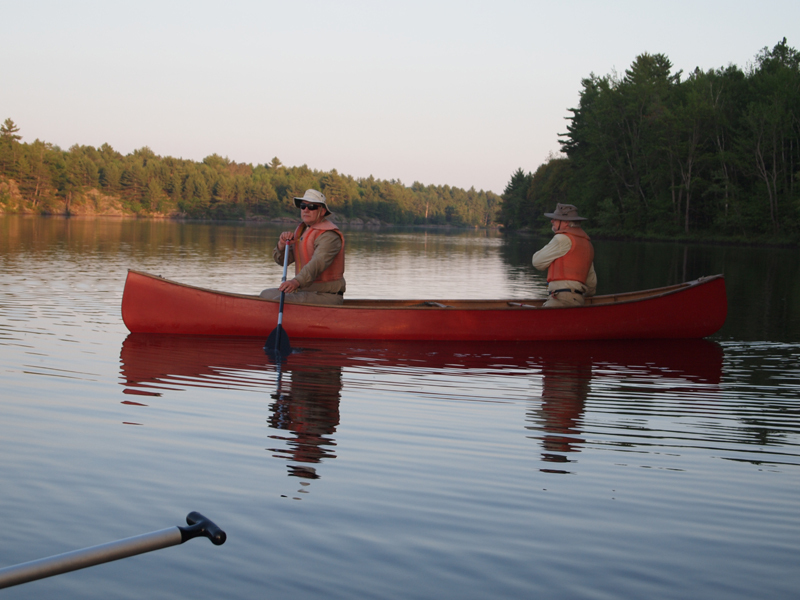 The portage to Cooney Lake (from Sheldon) was wet in places and full of mosquitos, We also paddled Peter’s Pond to get to Victoria Lake (the portage is also the Ganaraska Trail in places and you have to pay attention when it leaves the trail). Pulled down over one 2 foot beaver dam just before Victoria. 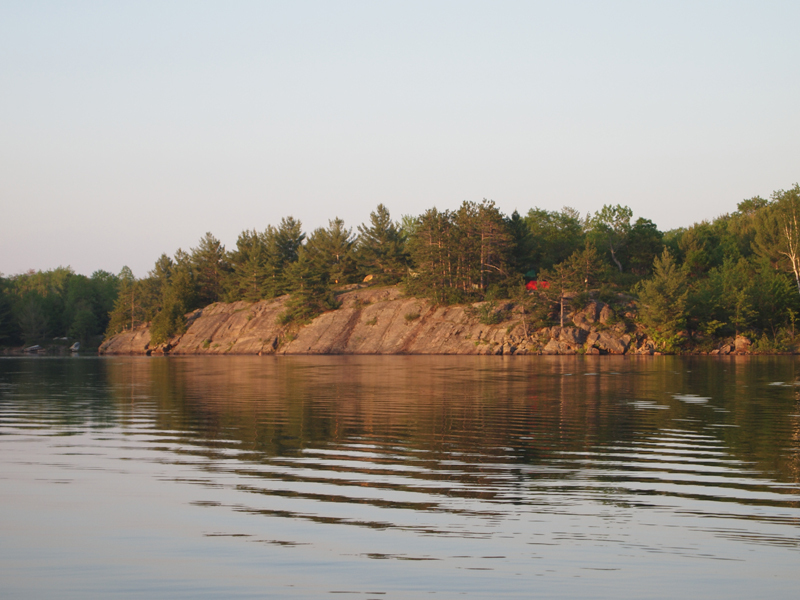 There are cottages (one each, plus a cabin on north side on Victoria) on both lakes. 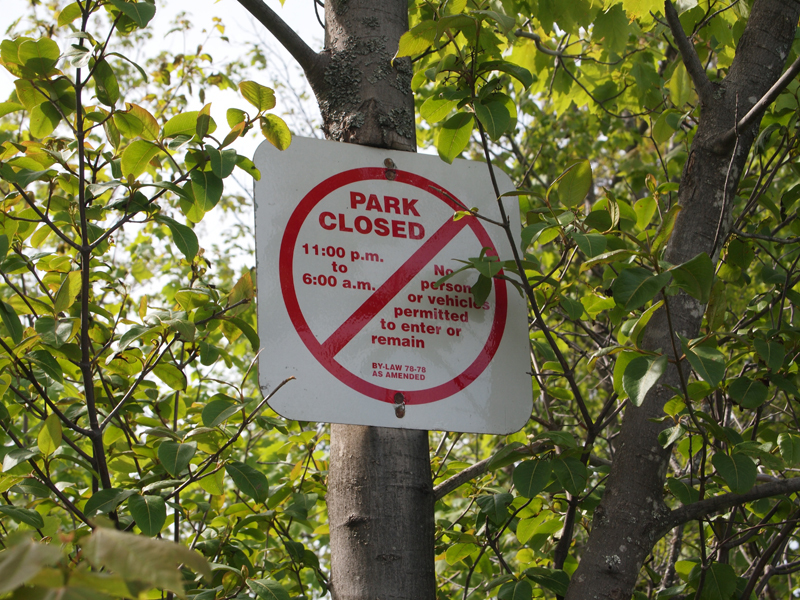 It is very open and the forest consists of smaller trees, so there’s not much shade at all. Portage to Wolf is a mere 20m long over a sliver of land. Ganaraska trail crosses there north to south. We had a bucketful of mosquitos on the way back on the portage (we wore bug shirts and nets, but our hands got about 12 mosquitos on each one- I refuse to apply bug dope unless absolutely needed). Day 3 – Saturday, May 22. Today we decided to paddle completely around Sheldon Lake starting down the east side and returning on the west. The lake has high cliffs on both sides with the east side being somewhat higher. 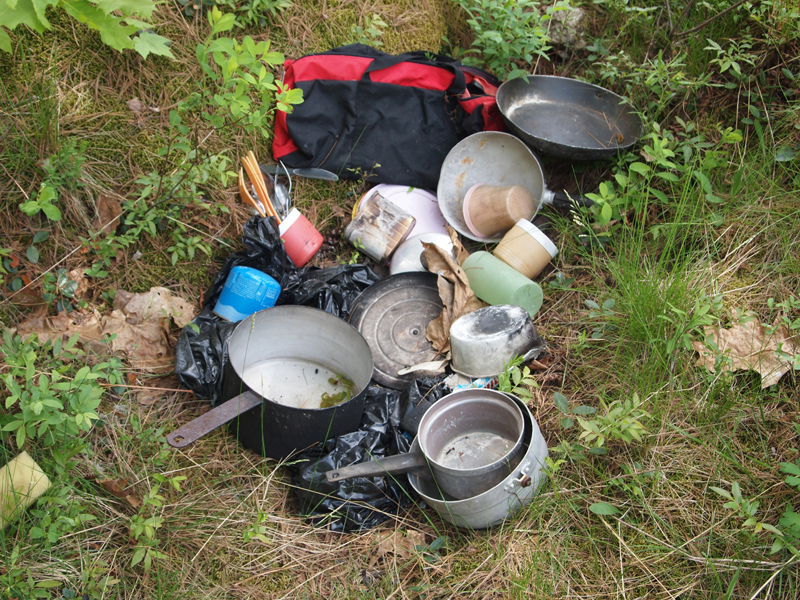 We stopped for lunch about halfway down the east side at a campsite where we found a pile of garbage left by the fishing crowd no doubt. Near the south end of the lake we saw about a dozen turkey vultures gliding on the thermals and a few swooped down to check if we were still alive!! At the end of the lake we explored the narrow gorge where Black Creek exits the Lake down to Black Lake (there were a few old canoes cached there). 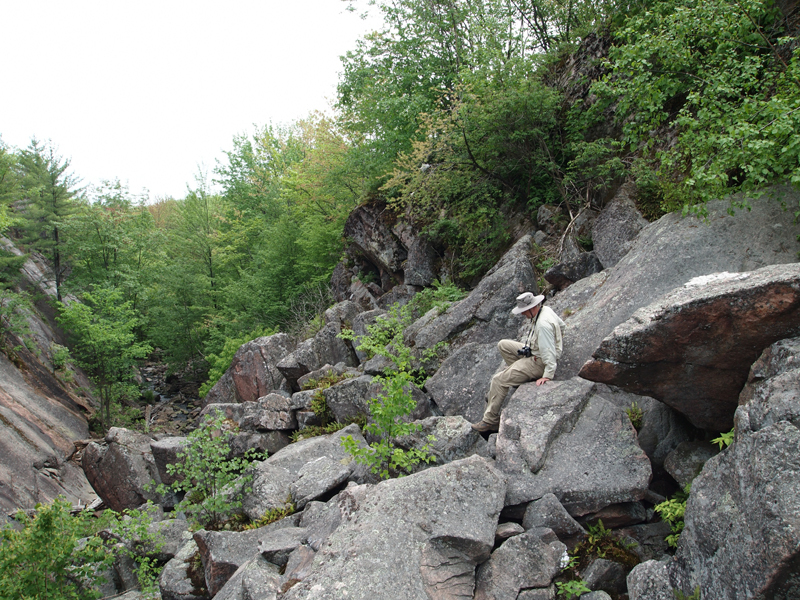 There is a lot of loose rock and big boulders and later we found out that this is also the portage. 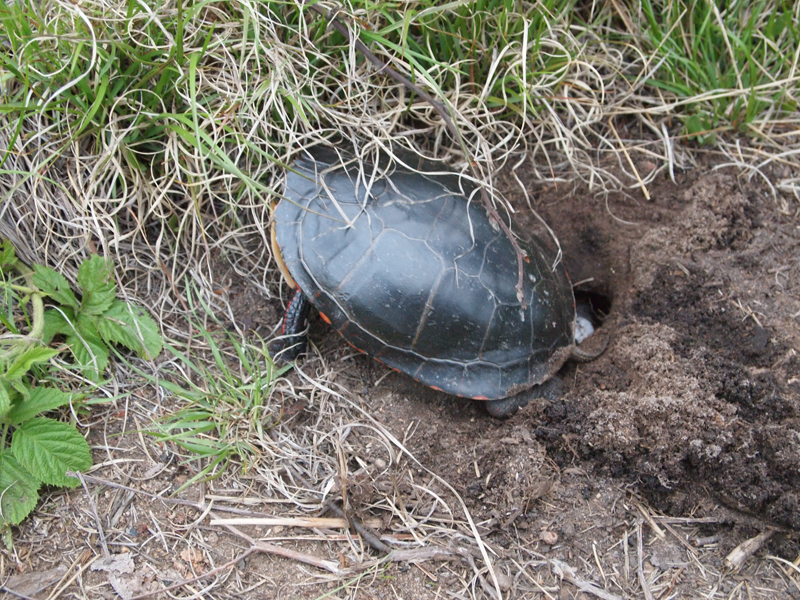 Back at the campsite we found a painted turtle laying eggs on the path from the landing to our tents. We watched her and took pictures. In the evening when she was finished she tumbled and rolled down the cliff to get back to the water (this was quite high and very steep and I don’t know how she climbed all this way). It was an art form to take a dump with the mosquitos waiting in the wood and one had to be very quick!! As I said before it was a very hot and dry weekend except for a tiny sprinkle Friday evening and early Saturday morning (just a few drops). Day 4 – Sunday, May 23. Today we went down the lake to check out a cabin on the east shore (cottage owners told us that this cabin was built by a couple who went on their honeymoon there in 1952 and have been coming ever since) and to climb some high cliffs on the east side. It was easy climbing through the woods and all the vegetation was very dry to touch. The views are impressive from the top! After dinner we went for an evening paddle and also over to the cottage for the hockey scores!! We saw no one the whole weekend (not counting the seven people at the cottage). Day 5 – Monday, May 24. Out today at noon over the portage in the stultifying heat and merciless sun and back to the cars. Stopped for dinner in Orillia. Overall a very enjoyable trip, great scenery, saw mostly birds, no four legged creatures. We had noisy nights with whip-poor-wills singing loudly away, sometimes right by the tent and into our ears!! There are more pictures in the Gallery. It takes too much time to do this!!!! Gets a little busier once bass season opens. That is why I try and go before and after bug season. I bet it was the mosi's that chased those other campers away. and the heat from the rock, even in cool weather out of the wind it can get pretty warm. It is pretty country though. And the Black creek canyon looks impressive. How far down wolf did you go? We went as far as the Wolf's Den cabin (had lunch around there). it must have been boiling trying to sleep in that heat. Nice to hear some "history" of the area from someone who knows! Welcome to our little paddling heaven! !